King Crimson and Emerson, Lake and Palmer's Greg Lake has died aged 69. The singer, guitarist and bassist passed away following "a long and stubborn battle with cancer", said his manager. Lake served as the bass player and vocalist for King Crimson on seminal 1969 album In The Court Of The Crimson King, before founding Emerson, Lake and Palmer the following year. The news comes after Lake's bandmate, Keith Emerson, passed away in March this year. Tributes have already been coming in for the musician via social media - we've shared a brief selection below. 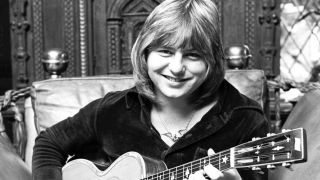 "Music bows its head to acknowledge the passing of a great musician and singer, Greg Lake." "Very sad to hear of the passing of our friend legendary Greg Lake Our thoughts & condolences are with Regina & Natasha & all the family - YES"
"Another sad loss with the passing of Greg Lake....You left some great music with us my friend & so like Keith, you will live on." "And now, I'm so sad to hear of the passing of a musical giant in my genre. Yesterday, my dear friend Greg Lake died from cancer. RIP." "Very sad news about Greg Lake. I had the privilege of working with him on several projects. His great talent will be sorely missed by all." "Well, I just read the that Greg Lake has passed away and it's both devastating and shocking news. I can't even begin to describe how much of an influence his music was/is to me. He was a pivotal figure in both King Crimson AND Emerson, Lake & Palmer! That's some track record! "On many occasions people have told me my voice sometimes sounds like him, which is a compliment beyond comprehension. I can't take it in of course, it's just too much. For years we have been talking about covering Cat Food off the second Crimson album, In The Wake Of Poseidon, but it's never materialised. Perhaps now there's an incitement to do so. As a tribute if nothing else. He was great. A giant in the progressive rock scene, and he will be sorely missed."